Apple Carplay – Car Audio 2.0? It’s been roughly four months since Carplay officially released to the first Apple launch partner Pioneer Electronics. How has this impacted the aftermarket 12-volt retailers? Has this feature been a selling point for its OEM partners Honda, BMW and Mercedes Benz? What does Carplay offer? In a nutshell, it offers the same interface and simplicity as your iPhone. I heard a sales person say, “If you can operate your phone, you can operate this head unit.” This got me thinking. Typically you think a double din head unit should have all the features, video, crossovers, time alignment, etc. But in this world of tablets and laptops, are these submenus and functions intimidating to most buyers? The iPod changed the world of portable music. OEM manufacturers are now adding smartphone integration to most vehicles. Ford’s SYNC system is a prime example of this. Most buyers of car audio upgrades say they are happy with such systems. Why change? There will always be room for the consumer that wants the best and wants to adjust every feature. But for most people today, their level of technical “know how” is “apple.” It’s strange to use this term, but it paints a clear picture. You might say “my demographic is 16-24-year-olds”. But I will make this statement. Most 16-24-year-olds have many distractions to spend their money on. But they usually have a phone, if the transition of getting people into an aftermarket head unit is the ease of operation, then Carplay is for them. If they are a 29-year-old soccer mom, 17-year-old male, a 42-year-old businessman, they can operate this head unit. Of course, the head unit offers all the features we expect for an aftermarket system, but “if you can operate your phone, you can operate this head unit.” This statement seems brilliant. As mentioned prior, Pioneer was a launch partner with Apple Carplay. Now other manufacturers like Alpine Electronics offered a head unit for 2014. I am sure others will follow in 2015. 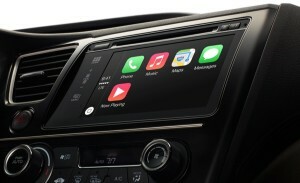 With Carplay you can access music, messages, voicemail, maps, and Siri with an apple style interface. But if the user wants it all, a simple press of a button and you have a fully customizable interface with all the features. If you get a chance to get a demo from a local dealer, it’s worth a look. Car Audio 2.0, we will see what happens in 2015.